Diversity NOW! Is the latest campaign from the award winning team at All Walks Beyond the Catwalk, founded by Erin O Connor, Caryn Franklin and Debra Bourne. Diversity NOW! will harness the fashion talents of students in colleges up and down the country from Manchester, Edinburgh, London, Southampton, Leeds and Bournemouth to name a few. The aim of this National Student Competition in association with i-D Magazine, sponsored by Succeed Foundation and supported by Graduate Fashion Week and Arts Thread, is to empower the next generation of creatives, from design, film, photography and journalism to create a fashion future that promotes a broader range of body and beauty ideals to truly celebrate individuality. The above pictures are examples of work, from students who have been inspired by the All Walks lectures we give up and down the country. These are a starting point and we want your ideas showcased in a high fashion way, to continue and enlarge the dialogue around diversity. As M&S, our first sponsor back in 2009, has just released a campaign in the spirit of All Walks, we are delighted to see small shifts…Long may their campaign rule (in various forms)! But you, as the big names of tomorrow….the Art Directors, the Menswear and Womenswear Designers, the Stylists, the Show Producers, the Journalists, the Film Makers…you have the chance to begin bigger change by shaping the future of fashion now. Think Diversity NOW! Take your lead from visionaries such as Vivienne Westwood, Nick Knight, Mark Fast, Lee Alexander McQueen and Chen Man to name a few, who prioritise pushing the boundaries and work consciously to make a statement around diversity. We are looking for directional, aspirational imagery and design showcasing fashion on a range of bodies, ages and skin tones or writing and thinking that shines a light on the way forward and challenges beliefs that only one body ideal is aspirational and marketworthy. Take a moment to explore our site and check out the campaigns we have created since 2009. We’ve been lucky to work with top creatives as you can see… and now we want to work with YOU. Read what i-D say about Diversity NOW! i-D magazine: i-D Magazine has recently celebrated 30 years at the forefront of cutting edge fashion and ideas and has always promoted diversity and individuality. A magazine for thought leaders and creative pioneers, i-D Online will feature winning work of students who offer progressive ideas on diverse body and beauty ideals. Arts Thread: Arts Thread is the world’s leading creative graduate network, bridging the gap between education & the design industry. In little over 2 years Arts Thread has built relationships with over 80 International Art Colleges in 16 countries and helped over 400 design graduates gain employment with some of the leading brands worldwide. Graduate Fashion Week: Celebrating over 21 years of promoting student talent to industry and press, GFW supports All Walks in putting emotionally considerate design and messaging on the agenda. OWN LABEL was set up following a collaboration between students from the University of the Arts and London Business School to promote creative design at affordable prices by working directly with emerging fashion designers. 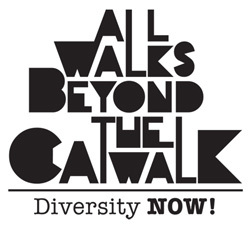 The Edinburgh College of Art Centre of Diversity in association with All Walks Beyond the Catwalk: Run by Director Mal Burkinshaw, Programme Director of Fashion at of Edinburgh College of Art. The C.O.D aims to create a long term ‘Network Centre of Excellence,’ for research relating to emotionally considerate design for a range of body shapes. The centre will be a hub for dynamic and challenging creative research that will span the breadth of modern fashion pedagogy. Announcement of this competition took place on June 12th at 9.15am as part of the Futures Forum presented by All Walks in the Victoria Rooms, Earls Court 2 as part of Graduate Fashion Week. The following colleges have confirmed their participation. « Origin	» Who Are All Walks?